Hayes & Yeading’s second pre-season fixture, this time on the training pitch at The Sharda Glass Community Stadium, saw a more cohesive performance in beating Slough Town 3-1 courtesy of a Jake Reid hat-trick. With Manager Phil Babb assessing his options ahead of the coming season, more new faces appeared in the United line-up for this fixture with some of the substitutes from Saturday getting a start to show what they could do also. United’s intentions showed well after just 3 minutes when Daniel Wishart sent Jake Reid away on the left, the experienced striker cutting inside to force a save from Slough keeper James Hawtree. Five minutes later United nearly contributed to an opener for the visitors when Dean Inman’s headed back pass was intercepted by Aaron Lansiquot but the lobbed effort over keeper Ashley Harris drifted wide of the target. With 15 minutes played United were again denied by Hawtree who pulled off a fine one handed save to deny Jack Mills after an excellent pull-back from Reid set up the former Staines man. 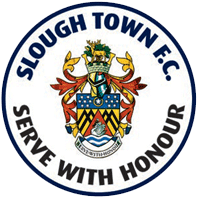 Just before the half hour mark Slough were again indebted to Hawtree when Luke Williams played a free-kick low to the left to a waiting Wishart who moved into the box before seeing his rasping drive brilliantly tipped over. The resultant corner was met by Inman at the far post by his header went the wrong side of the post. The deadlock was broken in the 36th minute when Kameron English broke in the area on the left, he held off his marker before pulling the ball back just behind Reid but the striker reacted quickly and volleyed the ball back into the Rebels goal. Just four minutes had been played in the second period when the United lead doubled. A punt upfield was allowed to bounce and this caught Hawtree out as he failed to connect and Reid was on hand to head into the empty net. Just after the hour Reid created an opening to newly introduced strike partner Luke Medley but the Rebels stopper managed to scramble away his effort with the same player forcing another save seconds later, this time a tip over from a 20 yard drive. Inman then went close twice in quick succession for United before a free-kick at the other end by Lansiquot saw Craig Bradshaw brought into action, diving left to deny the Rebels. With 20 minutes remaining, the impressive Reid completed his hat-trick, a burst down the left flank by Tom Bird saw him centre the ball low to the near post where Reid showed his predatory nature by nipping in the squeeze the ball home. Two minutes later Reid should really have had another, his glancing header from Jack Pattison’s centre drifting wide of the upright. The Rebels gave themselves a lifeline on 80 minutes when Pattison and Malkai Emmanuel were caught in possession trying to see the ball out of play by Ryan Blake, his pull-back to Scott Harris saw the striker fire past Bradshaw from 8 yards out. Chances still came and went as the game drew to its conclusion. Stefan Cox set up Maurice Harrison but his attempt to chip the diving keeper was halted by a stretched up hand, one of many fine stops by the Rebels keeper. Two more chances came at the other end which saw an angled drive by Lansiquot fly over and an excellent dipping shot by Jamie McClurg was tipped over by Bradshaw at full stretch.